Add your own personalized Valentine's Day message to this captivating wine crate that doubles as a lantern. See the alternate image of this gift - the included string lights will illuminate the beautiful pattern and engraving, creating a keepsake they'll treasure. One Bottle of Dunlin California Brut. For more information on this wine, please see the Tasting Notes. This fine wine gift is presented in our enduring keepsake wooden wine crate. A complimentary card with your personal message or greeting is included with your gift. Free Engraving! Enter 3 lines, up to twenty-three (23) characters per line. Enter information to be engraved during the checkout phase of the ordering process. Valentine's Day Engraved Lantern Wine Crate is a hand delivered gift. These gifts are delivered by one of our local design centers located throughout the United States and Canada. Same day delivery is available for most gifts when ordered before the cutoff time. 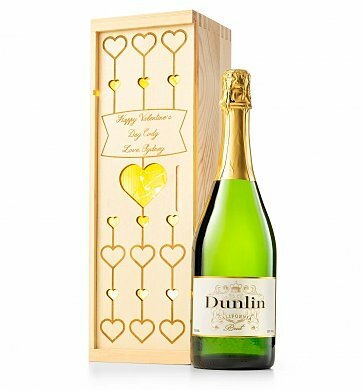 The cutoff time for Valentine's Day Engraved Lantern Wine Crate is in the recipient's time zone.